Following in the footsteps of the Masters of Carmel, Father Marie-Eugene has set forth this synthesis of the rich doctrinal teachings of the Carmelites with the sureness born of a long and deep contemplative experience, thus offering an ever vital doctrine to men and women of our times. By bringing to light the divine dynamics of baptismal grace, Father Marie-Eugene opens up the paths of contemplation and holiness to all, in the midst of ordinary life. He points out the way of love, the fullness of Christian life. This book and his companion work, I Want to See God, illustrate the untiring search for God through time and the need for reliable spiritual Masters. 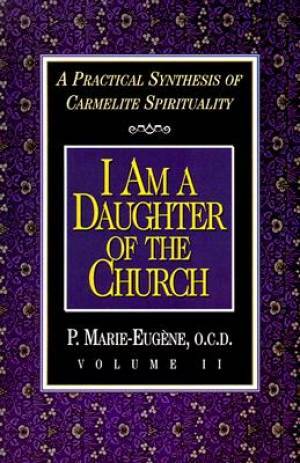 I am a Daughter of the Church by Marie-Eugene was published by Ave Maria Press in April 1998 and is our 32881st best seller. The ISBN for I am a Daughter of the Church is 9780870612244. Be the first to review I am a Daughter of the Church! Got a question? No problem! Just click here to ask us about I am a Daughter of the Church.